We are a leading Manufacturer & Supplier of Cup Sealing Machine such as Automatic Cup Sealing Machine and Semi Automatic Cup Sealing Machine from India. 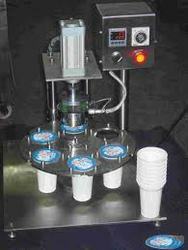 Being a well established organization, we bring forth an excellent assortment of Automatic Cup Sealing Machine that can fill varieties of ice cream such as plain or with ripple. Our offered sealing machine is developed by using premium quality components under the direction of our adroit professionals. This sealing machine is inspected on various quality parameters to ensure their excellence. 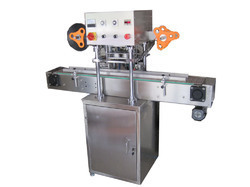 This sealing machine can be availed by our customers at market leading rates in a given time frame. With the thorough understanding of the relevant industry, we are offering a wide range of Semi Automatic Cup Sealing Machine. Our skilled professionals manufacture this sealing machine by using the best quality material and modern technology in accordance with the set norms. This sealing machine is designed for uniform heating and preventing heat loss. We also offer this sealing machine within committed timeframes to our clients.